This work explores the ethical boundaries of judges speaking to the media and others concerning their impending or pending cases. We ultimately take a rather dim view of the practice, with particular scrutiny applied to instances in which judges defend or explain their rulings in the press in response to criticism. The primary problem is that by commenting on the merits of pending cases over which the judge is presiding, she is elevating her personal interests (most commonly, either self-aggrandizement or self-defense) over the interests of the parties or even the more abstract interests of justice. Another problem with these extrajudicial comments in practice is that they result from, or at least are influenced by, ex parte contacts with the media — contacts that are unknown to (or at least practically uncorrectable by) the parties. Furthermore, a regime of extrajudicial speech fails properly to incentivize judges to explain their official actions where it counts, namely, in their rulings and opinions, not to the media or other external outlets. Finally, and perhaps most importantly, because the likelihood of disqualification is so high when a judge extrajudicially comments on anything close to the merits, the outspoken judge regrettably buys herself a one-way ticket off of the case. Therefore, unless the commenting judge has some (better) proof that the comment will benefit (or mitigate a detriment to) some legitimate cause other than herself, she generally should leave the extrajudicial commenting to third parties. 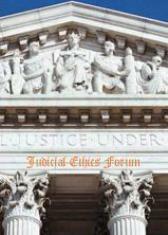 Mark I. Harrison & Keith Swisher, When Judges Should Be Seen, Not Heard: Extrajudicial Comments Concerning Pending Cases and the Controversial Self-Defense Exception in the New Code of Judicial Conduct, 64 N.Y.U. Ann. Surv. Am. L. 559 (2009). A link to the piece can be found in Articles as well.